Kathy Joy enjoyed life in Colorado as a favorite D.J. until her husband decided he would like to try his hand at running the family farm in Pennsylvania. Within four years of the move, Kathy Joy's husband passed away from sudden cardiac arrest. Displaced, and newly widowed with two girls to raise, she sold the family farm and earned the ire of her husband's family. She moved to the city to find work, but by that time, Kathy Joy could barely put one foot in front of the other. One day she began to journal three reasons to celebrate living as her personal daily therapy. She called these thoughts her Everyday Celebrations. Kathy Joy knows how to turn a phrase. Her fans encouraged her to write a book, and the rest is history. Breath of Joy! Ah, Autumn by Kathy Joy falls into the genre of children’s picture books. This book would appeal most to a mixed audience of children and parents who wish to embrace the season of autumn. This book utilizes images and words to bring all of the aspects of autumn together into one book that allows the reader to embrace the season. Are you ready to be inspired by, reminded of, and shown the beauty of autumn? Breath of Joy! Ah, Autumn by Kathy Joy is an interesting book that surprised me with the amount of emotion it could evoke using only images and a few lines of text on each page. The overall feeling of the book reminded me of a scrapbook with how each page was filled with images covered with a few lines of text that emphasized the feelings of the pictures. One of my favorite pages was the picture of a canyon that had the words "The echo of the canyon” repeated four times with the words fading away a bit more with every repeat. I really liked this page because the author did an amazing job of recreating the feeling of speaking in a canyon and hearing my own words echo and get softer and softer. The fact that each page has only a few lines of text makes this the ideal book for children, as there are plenty of pictures to keep their interest with just enough words to guide them through the book without boring them with too many words. Overall, I found that I really enjoyed this book and I felt like it reminded me of some of my own life experiences as I read it! Breath of Joy! Ah, Autumn is an inspirational picture book for children of all ages written and with photographs selected by Kathy Joy. No one can argue with the mystery and promise that is the fall season. Autumn’s first hints of coolness provide a welcome change from the last, heat-laden days of August, and the change of seasons is filled with promise. Joy gets the magic that is autumn and celebrates this season in her book. The young, as well as those who see education as not solely the province of the young, will instantly associate the fall season with the end of the summer vacation and the beginning of a new school year. They’ll feel the rush and excitement of being on campus again, of buying new books, sitting before new professors and starting academic journeys. Others watch as pumpkins grow robust and full in anticipation of the Halloween and Thanksgiving holidays. What does autumn mean to you? Kathy Joy’s inspirational picture book for children of all ages, Breath of Joy! Ah, Autumn, celebrates the change of seasons as the days grow shorter, shadows lengthen and the leaves on trees dazzle with their multi-color displays. Each page offers images that excite the imagination or lend themselves to a few moments of repose and reflection. I found myself drawn to those images relating to academic seasons, and that incredible library held me spellbound. That said, the nature photography found within this book is superb. You can almost feel those colorful leaves crunching underfoot as you walk in the still coolness of late afternoon, and shiver a bit at the bite of winter’s promise. Breath of Joy! Ah, Autumn offers magical interludes that hint at autumn’s majesty and mystery. It’s most highly recommended. Breath of Joy! Ah, Autumn by Kathy Joy is a coffee table book on the wonders of the Fall or Autumn season. Breath of Joy is a short photographic book and every page contains beautiful visuals related to the Autumn season, along with a few words describing it. This book is intended to evoke the spirit and feeling of Autumn and includes almost all Autumn-related things such as the wind, the breezy chill in the air, cozy evenings by the fireplace, sipping a hot beverage, coffee, books, new beginnings in school and life, colorful leaves, bright, vivid colors of the trees, pumpkins and apples, pies, Autumn delicacies, harvest time, hay, long evenings, twilight, camping in the woods, and more. Each of these concepts has been brought out beautifully through photographs and images that showcase the beauty and spirit of the Autumn season. Breath of Joy by Kathy Joy is a “feel-good” book and is essentially more of a themed photographic collection than a book per se. It would be good to have this book on the center table as a conversation starter or just a beautiful, colorful seasonal book that captures the essence of the Autumn season. Looking through it, I almost felt like I was in the midst of Autumn weather myself. Without a doubt, the pictures make this book what it is, and that was my favorite part about this book ... just looking at the photographs again and again. This is a simple and beautiful book that would be a great addition during the Fall season. Breath of Joy! Ah, Autumn by Kathy Joy shares the joys of the fall season through poetic words and beautiful illustrations. Imagine your favorite fall memories. Gourds, spider webs, hay bales, apples, bandit winds, coffee beans, football games, and traditions galore. You will find those in Kathy Joy’s book. She takes you on a journey from the beginning of fall to the approaching of winter by connecting autumn events to the past, the present, and to the current moment. My favorite page is the echo of the canyon because I feel like I’m actually hearing the echo. What beautiful writing. Some alliterative, some poetic, and some just plain caused me to live in the moment. The spread with geese sewing up the sky was so emotional and so touching. Breath of Joy! 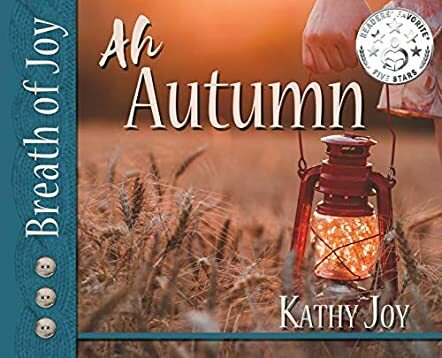 Ah, Autumn by Kathy Joy enlivens every sense in its storytelling. Designed as a coffee table piece or a gift for guests at a fall event, this book ensures that everyone will enjoy the lovely illustrations as well as the imaginative journey from summer through fall and on to winter. The reader leaves with the feeling of pure enjoyment and the desire to move on to what life has to offer next. Breath of Joy! Ah, Autumn is the second in a series of seasonal delights offered up by Kathy Joy. Her first in the series is Breath of Joy! Simply Summer. They both offer active connections to life’s wonders. I highly recommend this book to anyone searching for a great gift for dear friends and family.